Monitor your travelling irrigator from your cellphone! EffluTrack shuts off the pump automatically if there’s a fault and let you know also lets you switch your electric pump on or off by remote control. It only takes a simple text message. 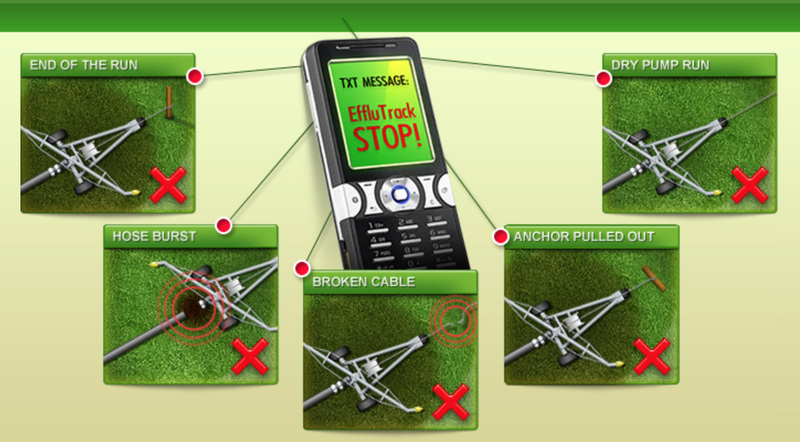 EffluTrack makes it easy to track your travelling irrigator. If anything goes wrong, you get a text alert on your mobile phone – at a fraction of the cost of other systems. EffluTrack helps you comply with the environmental conditions of your resource consent. Cut down your supervision and maintenance time to the minimum. Achieve effective effluent application as per your nutrient budget. Save cost – it only takes a one-off investment of as little as $1,799+GST. Take the hassle out of farm effluent application – order your EffluTrack Travelling Irrigator Monitoring System now!